The multi-species crew of the Veracity are enjoying some well-deserved R&R after informing the galaxy about spread of the time-bending Messiah drug. Now that the galaxy has been saved again, the crew begin to see each other in a new light. Unfortunately, in the Veracity�s wake lie a string of crimes � and someone has got to pay. Former assassin Raena Zacari is hauled back to the weapons-free pleasure planet Kai to answer charges of kidnapping, murder, and the theft of an Imperial-era diplomatic transport: the Veracity itself. In the meantime, something is moving in the undersea city Raena destroyed on the Thallian homeworld. Has the worst mass-murderer the galaxy has ever known been cloned back from the dead? Can the Veracity�s crew lay the ghosts to rest without Raena�s lethal skills? No More Heroes mixes courtroom science fiction with sweeping space opera that features aliens, androids, drug dealers, journalists, and free-running media hackers. 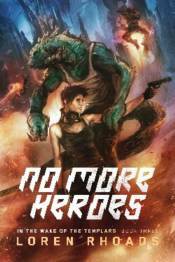 Following The Dangerous Type and Kill By Numbers, No More Heroes is the final book in Loren Rhoads�s epic trilogy.